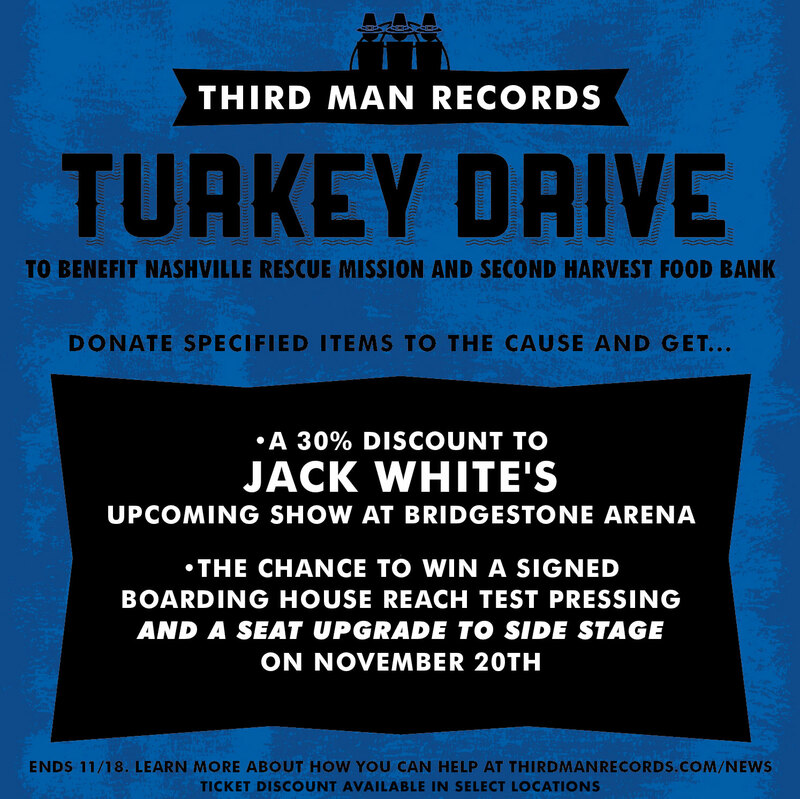 Jack White and Third Man Records announced today that in the spirit of the Thanksgiving season, they will be hosting a food drive for turkey and non-perishable goods donations. The drive will benefit the Nashville Rescue Mission – a partner of Second Harvest Food Bank of Middle Tennessee. As a small “thank you,” each donor will have the opportunity to get discounted tickets for select locations at White’s upcoming concert at Bridgestone Arena on November 20 PLUS be entered to win a Jack White-signed Boarding House Reach test pressing AND have their tickets upgraded to side stage seats at this special hometown show! Donors will receive a 30% discount code and one entry into the ticket upgrade sweepstakes by bringing the following to Third Man Records OR the Bridgestone Arena box office during normal business hours between today and November 18th. Each additional donation of a turkey or three non-perishables equals an additional entry into the ticket upgrade sweepstakes. Winners will be chosen at random and notified on November 19th. Tickets available at livenation.com, the Bridgestone Arena Box Office, or charge by phone at (800) 745-3000.